The telescope was a 115/805 TMB Apo refractor on Vixen SXD by 200x. 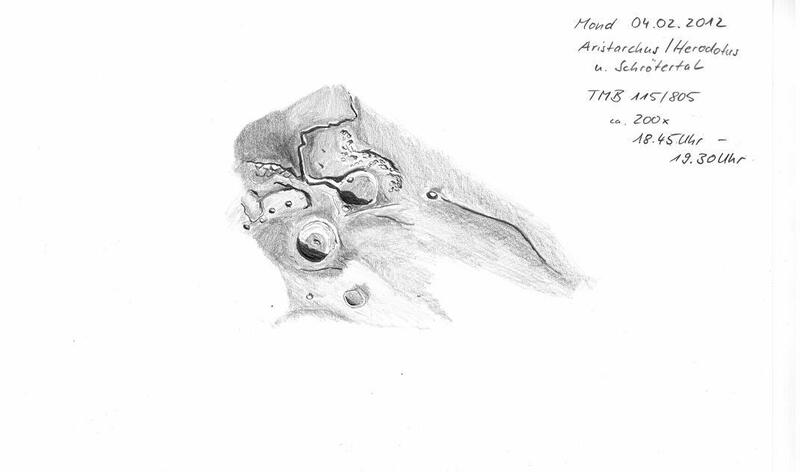 This is an excellent sketch of the Aristarchus plateau. Nicely composed and accurately drawn. Beautiful detail. It’s a fascinating area of the moon, and you’ve captured it well. Beautyfull hand Uwe!! Nicely draw of Aristarcus zone,my favourite. Do you want ,as possible,send your worcks in my FB page named “Astrodisegnatori italiani”? Hello and thank you for your statements about my picture. My comment is late but I was not logged in to write here. It was the first I sent to ASOD and I am very happy about the post on this page. @giorgio: I don´t want to be a Member by facebook, sorry!